This is one of my all-time favorite savory soups, ever. I highly recommend pairing it with some pesto-toasts to dip in it - just trust me on this one, you won't regret it. Recipe for pesto toasts down below the soup. In a large dutch oven, combine 3 Tbsp olive oil, 2 chopped carrots and 1/2 large chopped onion over medium heat for about 10 minutes, stirring frequently until they are translucent. 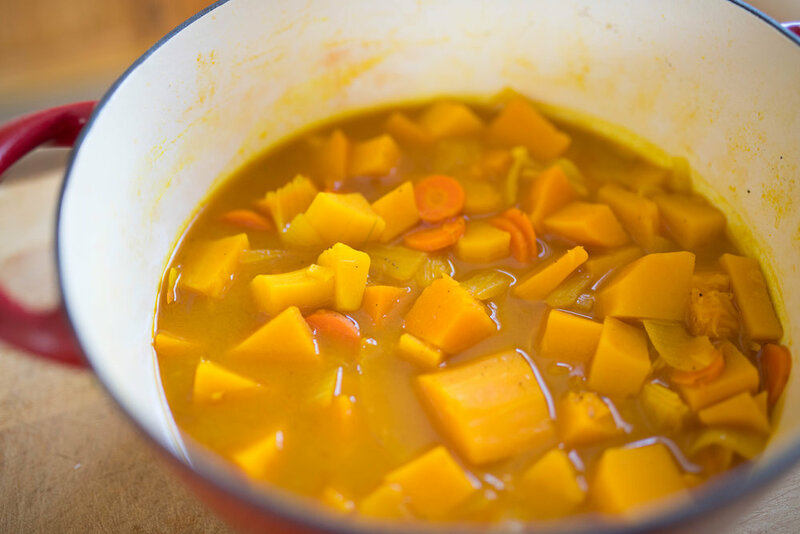 Add cubed squash, vegetable broth, 1/2 Tbsp turmeric powder, 1/4 tsp nutmeg, 1/2 tsp salt and 1/4 tsp pepper and turn the stove down to a low heat. Cover and cook for 25 minutes, stirring every 5 to 10 minutes. After 25 minutes - pierce the squash with a fork - it should be soft. Turn off the stove, uncover and cool the soup for 15 minutes. This next part can be a bit tricky - to make it easier, use a large ladle and a large glass bowl. Using the ladle, scoop the soup into your blender and puree it at a low speed in small batches. After pureeing each batch, pour the soup into your large glass bowl. Once you're all done pureeing, pour the soup from your large glass bowl back into your dutch oven. Not too bad, right? Next - add one 14-oz can of light coconut milk to your dutch oven and cook at a low temperature for another 15 to 20 minutes. While you're finishing up the soup - make the pesto toasts! Pre-heat your oven to 425 F. First - make a batch of my walnut pesto. Next - top each piece of gluten-free bread with a spoonful of pesto and put them on a baking sheet. Bake for 10 - 12 minutes, you'll know they're done when the sides are lightly toasted. Dip in your soup and enjoy!